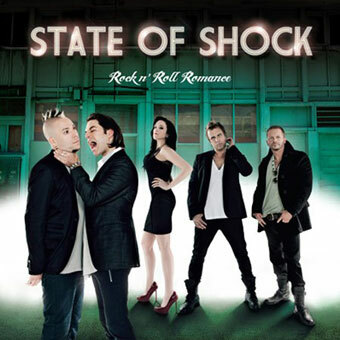 State Of Shock Biography, Discography, Music News on 100 XR - The Net's #1 Rock Station!!! 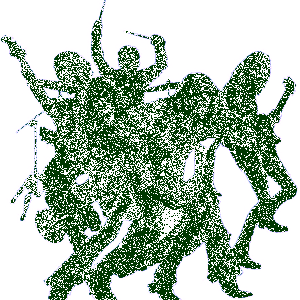 State Of Shock, based out of Vancouver, British Columbia CANADA, core members have been together since 1999 and each member respectively, has been playing in bands since their early teens. 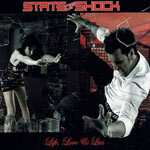 The line-up experienced several changes before before the band had released any official recordings and in 2002 State Of Shock was indeed formed with singer Cameron Melnyk, guitarist Jesse Wainwright, bassist Alison Toews and drummer Johnny Philippon. The band's debut album "Guilty By Association" arrived in 2004 and showed the State Of Shock's raw Alternative-Rock edge. Simon 'Kadooh' Clow, joined a couple of years later as the second guitar player; the group then focused on recording their second LP and their Cordorva Bay Records debut, "Life, Love & Lies", which was released in July 2007. The runaway success of lead single, "Money Honey", propelled the quintet to new heights that included a list of impressive achievements: State Of Shock was nominated for a 2008 Juno Award for Best New Group while "Money Honey" smashed into the top 10 of the Canadian Rock airplay chart and enjoyed a 9-month chart run on the Billboard Canadian Hot 100. Canadian sales of "Life, Love & Lies" have surpassed more than 25,000, which roughly works out to one for each person who saw State Of Shock open for Aerosmith at a concert in Sarnia, Ontario. Nickelback also took the group under its wings as the opening act for its summer tour.